Some of the best deals can be had by combining DIY-Budget Rules. For example, rules 4 and 5 (shop online discounters, plus choose sale items and/or coupons). Through November 11th, we have an awesome opportunity to combine all three at Light In The Box: a sale, plus a coupon off prices that are already low. It’s a great example of how combining the different rules can work. To see how much the total savings would be, I choose two on-sale items–the vase and favor box / card holders in the picture. Each table of six (six holders and one vase) totaled $7.44. Original list prices totaled $37.33. That comes to 80% off. 2) Chose items from their current sales section, here. The products and prices change all the time, but today’s price on the two items I picked–chair favor boxes with ribbons and a classic vase–sales prices came to 55 cents each ($6.57 a dozen) and $4.79 each, respectively. 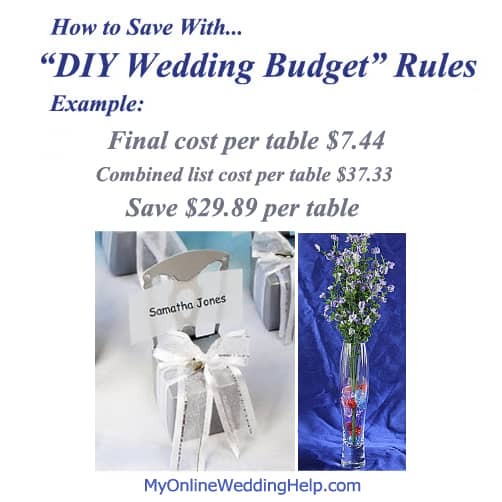 3) Used a coupon: LightInTheBox has set up an exclusive coupon for MyOnlineWeddingHelp.com visitors: $9 off $75 order from the wedding category with code: MyOnlineWeddingHelp. Nine vases and five dozen holders–enough for nine guest tables of six people each–was enough to use the $9 coupon code. The item total, with sales and coupon deducted, was $66.96, or 80% off the original list prices of $336.00 LOVE it!